There are lots of benefits for providing categories, Tags, Authors or Post specific Feeds for your site users, they can subscribe according to their own interest. As well, if you have different Feed, it will offer a good chance to increase your site traffic via search engine. For instance, if you are running a WordPress related blog and have different categories like WordPress Themes, WP Plugin, Tutorials, Inspiration, How to, Showcase etc. Some of your readers just interested in Tutorials related to WordPress and this way you can offer your site just to subscribe to one or more of interested category or tag related posts. There are several different kinds of feeds, read by different feedreaders. Some feeds include RSS (alternately defined as “Rich Site Summary” or “Really Simple Syndication”), Atom or RDF files. There are other four possible URLs for each of your feeds. Any of these will work. You can provide Feedreaders to subscribe through FeedBurner (Step by Step Guide to Setup FeedBurner for WordPress), because it give you lots of option for serving feeds, you can analyze your feedreaders with detail statistics and display other options such as sharing buttons. You must be aware that you can also use AdSense for feeds to earn revenue from content you distribute in your feed, FeedBurner is an external service owned by Google. To make it user friendly, There are three options to present your feed to feedreaders. You can Use WordPress plugin, by customizing function in your installed WP theme, or by editing your .htaccess file. Most of the site owners find that installing WP Plugin is easy way to enhance the features but at the cost of extra loading time and if the plugin is outdated than you need to do some extra work. I have found few hacks, if you have installed on WordPress other than root folder, after installing the plugin, if you encounter any error, read this hack: WordPress Feedburner Plugin Hack In case if you are using index.php file in your permalinks structure or having Custom Structure, this article is very helpful: How to use FeedBurner with WordPress without .htaccess file. To forward all RSS feed to your feed readers, you can use this hack: Forward WordPress feeds to feedburner. RSS King Pro gives you the freedom to display a RSS feed or feeds onto your pages and posts with ease. The numerous options available provides choice in how your feed displays on your pages. You can choose how many items are returned onto the page, whether the feed paginates and whether you display those pages via AJAX giving your users a simple way to view the feed your providing. One of the problems you can have when running a WordPress blog or web page is that the most of your audience usually read your updates using the blog RSS feed (with Google Reader for instance). One inconvenience of this is that the users get only the post content, and they don’t see the rest of your page. This includes all that space you have dedicated to your advertisers on it. Monetize your Feed will help you to maximize the audience for those banners inserting your ads in the RSS feed of your blog or web page. Even more. You can select which banner is inserted in any post if you want using shortcodes. Or insert category-related banners for each post. Ditty RSS Ticker is a multi-functional RSS display plugin. Easily add multiple RSS feeds to your site either through shortcodes, direct functions, or in a custom Ditty News Ticker Widget. Do you own a WordPress blog , magazine or any website? Then say goodbye to the nice, good, old-school sliders. They served us well, but it’s time for something new and more powerful… and cooler than a slider. 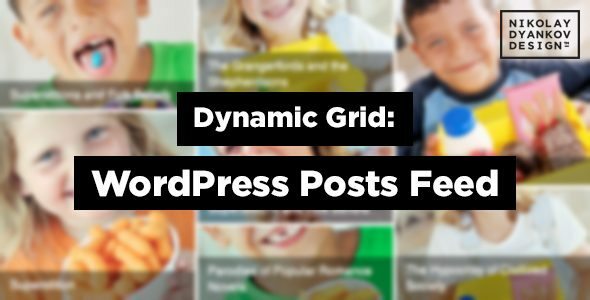 Dynamic Grid: Posts Feed is a next generation slider for your homepage, sidebar, footer, you name it. It takes posts from your WordPress database and arranges them in a nice looking, totally customizable and animated grid. 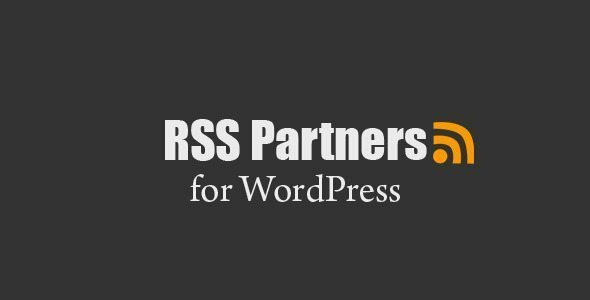 RSS Partners is a simple WordPress plugin for creating a list of RSS Partners for your site. With just a few clicks, you can add multiple sources of news/articles from your partners and favorite sources. The plugin is packaged with a simple configurable shortcode and widget. Style your layout with simple columns and partner logo. Give your site that edge like other popular blogs and give your readers more options to choose from. Redirect visitors to your website feed to feedburner. This will allow you to customize and track your feeds in ways that simply aren’t possible with just WordPress. Redirects the main feed and optionally the comments feed to Feedburner.com. It does this seamlessly without the need to modify templates, setup new hidden feeds, modify .htaccess files, or asking users to migrate to a new feed. All existing feeds simply become Feedburner feeds seamlessly and transparently for all users. Just tell the plugin what your Feedburner feed URL is and you’re done. FeederNinja Feeder Ninja is a useful tool for creating Rss & Social media feeds on the fly. Feeder Ninja using innovative and intuitive user interfaces so you don’t need any prior knowledge to use it. We’re supporting RSS, Facebook, Twitter, Pinterest, Thumblr, YouTube, Vimeo,and WordPress Sing up to Feeder Ninja now and start creating feeds! Any RSS feed can be grabbed. Call it in your footer to list your last few tweets, or your sidebar to showcase content from another one of your blogs. An other preffred option for WordPress developers is to create a new function, if its not available in your installed theme. In the following piece of code, feed_link action hook is used and its replaces all instances of your default WordPress feed (rss, rss2, atom, and rdf). All you have to rename the function and never forget to change the URL with your own Feedburner URL. If you are familiar with how to edit .htaccess file than go ahead and detail you can find on the links given bellow. All you need to do is under dashboard Go to Options>Permalinks in the WordPress administration menu and enable “fancy” urls by adding /%year%/%monthnum%/%day%/%postname%/ at “structure”. Feed Icons provides official RSS icons in many formats (AI, EPS, SVG, PSD, PDF, PNG, JPG, GIF). Subscribe our newsletter || and get free access to our resources and updates.